Our Signal Box is being decommissioned. The Friends of HB Station and Calder Valley CLT are working with Network Rail to preserve and restore the Signal Box for the community. Find out more. 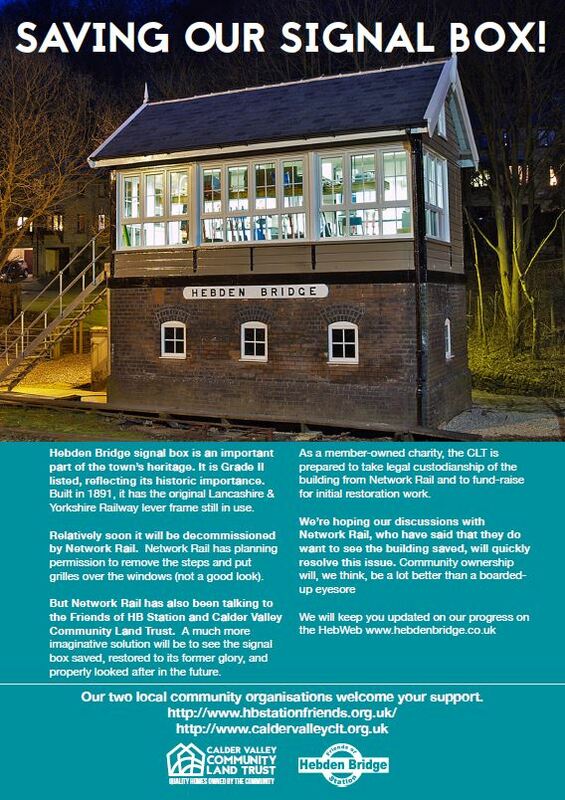 Hebden Bridge signal box is grade II listed, reflecting its historic importance. 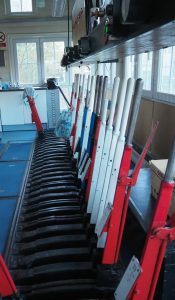 However, after more than 125 years as a familiar sight in the town, Network Rail’s staff pulled the levers to operate the signals for the last time in the Autumn of 2018. The signal box was decommissioned following the resignalling work recently undertaken on the Calder Valley line. The future of the signal box is at present unresolved. Network Rail has planning permission to remove the steps and put grilles over the windows. However Network Rail has also been approached by the Friends of Hebden Bridge Station and the Calder Valley Community Land Trust (CLT), who together have developed a proposal for the building to be saved, restored to its former Lancashire & Yorkshire Railway glory, and properly looked after in the future. Under the proposals, Calder Valley CLT would take on the legal custodianship of the building and would fundraise for initial restoration work. The CLT’s charitable objects permit it to hold key public buildings on behalf of the community, and it already holds the Fielden Hall community centre in Todmorden on this basis. A new Hebden Bridge Signal Box Preservation Group has recently been established, to work closely with the CLT and the Friends of the Station. You can reach this group by emailing hebdenbridge.signalbox.group@gmail.com. The organisations have held exploratory discussions with Network Rail, who recently confirmed that they too wish to see the building preserved. More discussions are planned, with the Friends of the Station and the CLT hoping that a quick resolution will be reached. The groups have been giving out leaflets about their initiative to railway travellers in recent days, and promise to keep local people regularly updated on their progress with Network Rail.